How you need to acclimate your new fish depends upon how your fish were packaged for shipping. The most common way fish are shipped is in a bag that is roughly 1/3 of the way full of water and 2/3 full of oxygen. However, an alternative way to ship fish is to use Kordon Breathing Bags, which are filled completely with water and no air. Breathing Bags utilize a technology that allows oxygen to enter the bag and carbon dioxide to escape the bag, eliminating the need to put oxygen in the shipping bag at all. 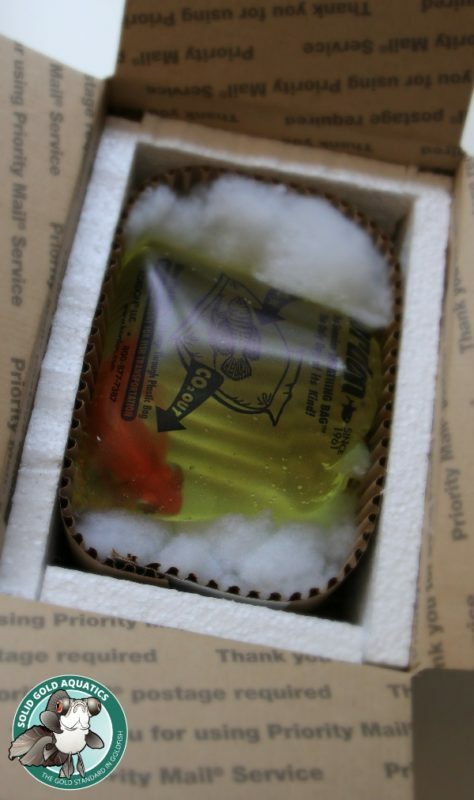 Here at Solid Gold Aquatics, we utilize both methods of packing fish for shipping. Please follow the appropriate instructions below, depending upon which packaging method was used for your fish. When your new goldfish arrives, open the box and remove the bag containing the fish. Float the unopened bag in your aquarium or pond for 10-20 minutes to match the temperature. Open the bag and quickly transfer the fish into your aquarium or pond with your hands. Discard the shipping bag water. This is all you need to do. Do not attempt to acclimate the fish to your water conditions by transferring aquarium water into the shipping bag over a certain period of time. Doing so can void our live arrival guarantee, as this process often does more harm than good. Here’s why: during transit your fish is excreting ammonia and CO2. The CO2 built up within the shipping water helps to keep the pH of the water low. In water with a lower pH, ammonia is much less toxic than the same amount of ammonia would be in a high pH environment. As soon as you open the shipping bag, CO2 begins escaping into the air, and the pH of the shipping water can quickly rise. As the pH rises, it can cause pH shock and also causes the ammonia built up in the shipping bag to become exponentially more toxic. If you open the shipping bag and attempt to gradually acclimate your new goldfish to your aquarium water by pouring some aquarium water into the shipping bag over a period of time, you are potentially exposing your new fish to irreparable damage. 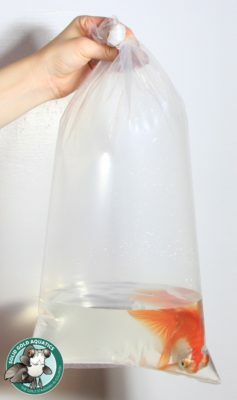 Simply float the bag for 10-20 minutes to match the temperature, open the bag and quickly transfer your new fish into your aquarium with your hands, and discard the shipping water. It’s really that simple! Do not float the Breathing Bag in your aquarium or pond. Doing so will void your live arrival guarantee, since floating the Breathing Bag in water reduces oxygen in the bag and can suffocate your fish. Open the Breathing Bag(s) and place all contents (fish and water) into a clean container. Add a double dose of Seachem Prime water conditioner to neutralize ammonia levels that have built up in the shipping water during transit. Remove 1/3 of the water and replace it with water from your aquarium or pond. After five minutes have passed, repeat the 1/3 water volume exchange. After another five minutes, repeat the 1/3 water exchange again. Wait five more minutes and the fish can be removed from the holding container and placed into your aquarium or pond with your hands or a soft net if you prefer. Try not to get the shipping water in your aquarium or pond.